NBA – The Cleveland Cavaliers general manager David Griffin is not yet done upgrading their team, after successfully sign the three times All-star Deron Williams (D-Will) as a backup point guard for Kyrie Irving and the playmaker that LeBron James is asking for, now another addition has been made. 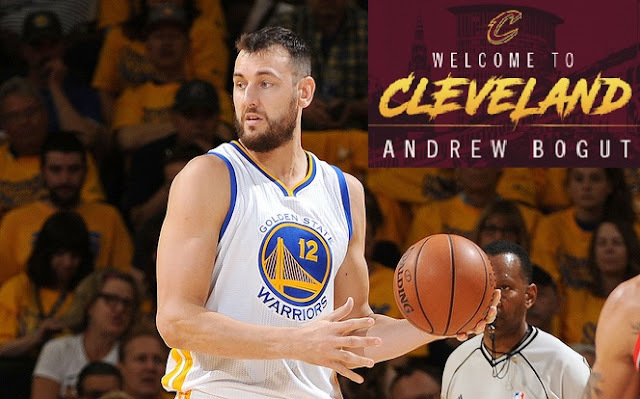 CAVS add former Golden State Warriors and part of the 2015 – 2016 Warriors NBA Champion Center Andrew Bogut. Several teams in the NBA shows the interest of acquiring the service of center Andrew Bogut after his former team Dallas Mavericks traded him to Philadelphia 76ers where the center and 76ers agrees to a contract buyout and finally waived on 23 February 2017. Bogut’s agent announced that the center is looking forward to join the Cavaliers ending speculation or rumors that the center will likely to go to Boston Celtics, San Antonio Spurs or Houston Rockets? On March 2, 2017 (US Time) after clearing his waivers Bogut formally signed with the Cleveland Cavaliers. The addition of Bogut gives size and strength on the Cavaliers bench that will give backup to starting center Tristan Thompson that they are looking for since the beginning of this season. Bogut known for his defensive prowess and a great ring protector will now improve the Cavaliers defense. This season the Cavaliers has been upgrading their lineup since losing some key players from last year NBA Championships and injury. First, it was a Kyrie Korver acquisition from a trade deal against the Atlanta Hawks, Derrick Williams signed a 10 day contract and now showing impressive performance and looks like he will be signed for the rest of the season, Deron Williams addition as a backup point guard and now Andrew Bogut as a backup center. Now, are the Cleveland Cavaliers being now a powerhouse team despite most of their players are over 30 years old or more including LeBron James? Is the Cavs favorite of winning the 2016-2017 NBA Champion against Golden State Warriors if they met once against in the NBA Finals for the third consecutive time with or without Kevin Durant in the lineup? What do you think? Kindly comment below for your suggestion. No Comment to " Former GSW Andrew Bogut Also Join the Now Power House Cleveland Cavaliers "